South Korean Youth Struggle To Find Jobs After Years Of Studying For Tests : Parallels For many Korean youth, the possibility of a job-for-life with a big conglomerate is the only option. As the economy slows, there aren't enough jobs for all the college graduates. 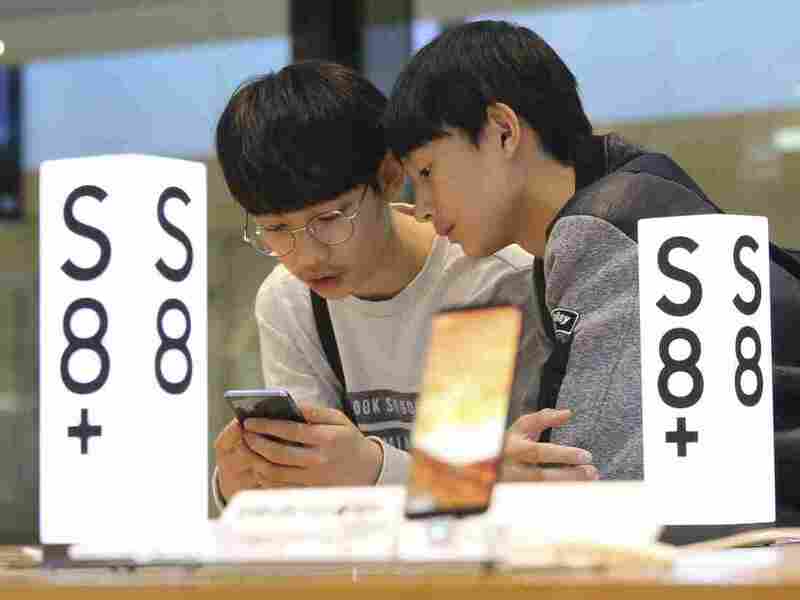 Students try out a Samsung Electronics Galaxy S8 Plus smartphone at a shop in Seoul, South Korea, on April 27. Many post-college grads in South Korea spend years studying for tests in the hopes of winning a job at a company like Samsung. Lim Hyuk-ju lives in a tiny apartment in a bustling student neighborhood of South Korea's capital, Seoul. The apartment is just 30 sq. ft. — basically a walk-in closet with a toilet, shower and shared kitchen — for $400 a month. "It's uncomfortable, because when I lay down my legs hit the back wall," explains Lim, 25. She has to be quiet because the walls are thin. Lim's neighbors are all young people like her, studying 15 hours a day for job entrance exams. Lim graduated at the top of her high school class. She wants to be an accountant. So for now, her parents support her on a path that's typical for young South Koreans: Study for months or years to pass exams for jobs in government, or in big family-run Korean conglomerates like Samsung, LG and Hyundai. "All these tests, and memorizing the right answers," says Lim, "I sometimes wonder if this is really the only way to succeed." Lim Hyuk-ju, 25, in her 30 sq. ft. apartment in Seoul. Lim pays $400 a month for this tiny space, where she studies 15 hours a day for job entry exams. Her path is similar to many youth in South Korea, where unemployment among 15- to 29-year-olds is nearly three times the overall rate. South Korea's economy has slowed, and it appears to have hurt young people the most. Some 11.3 percent of youth aged 15 to 29 are out of work. That's nearly three times the overall jobless rate. A new liberal president, Moon Jae-in, won office earlier this month, with huge support from young voters. Now one of his first tasks — on top of dealing with nuclear-armed North Korea — is to improve the economic prospects for young South Koreans. Big conglomerates, or chaebols, run South Korea's economy. Sales revenue from the top five chaebols amounted to 58 percent of South Korea's GDP in 2015. And it's not only cellphones and cars. In Korea, there's a Samsung art gallery and a Samsung amusement park. You can buy life insurance from Samsung. In the case of Hyundai, the big Korean carmaker, the company also runs a hospital in Seoul. LG, another electronics giant, also has a Korean cosmetics line — and dozens of other businesses and subsidiaries. "They're just giant conglomerates that control so much of the economy on a scale just not seen in a lot of the world," says Geoffrey Cain, who trained as an anthropologist and is writing a book about Samsung. Cain says South Korea's conglomerates are so pervasive, they squeeze out smaller businesses. "They can basically tell a small business to supply them a part and just pay them whatever they want, and then pay them whenever they want, and give them a terrible contract," he says. Small businesses struggle to grow. "So that's what creates so few job opportunities," Cain says. For many Korean youth, it's the dream of a job-for-life with a big conglomerate — or nothing at all. As the economy slows, there aren't enough jobs for all the college graduates here. So many turn to test-taking, as competition rises. 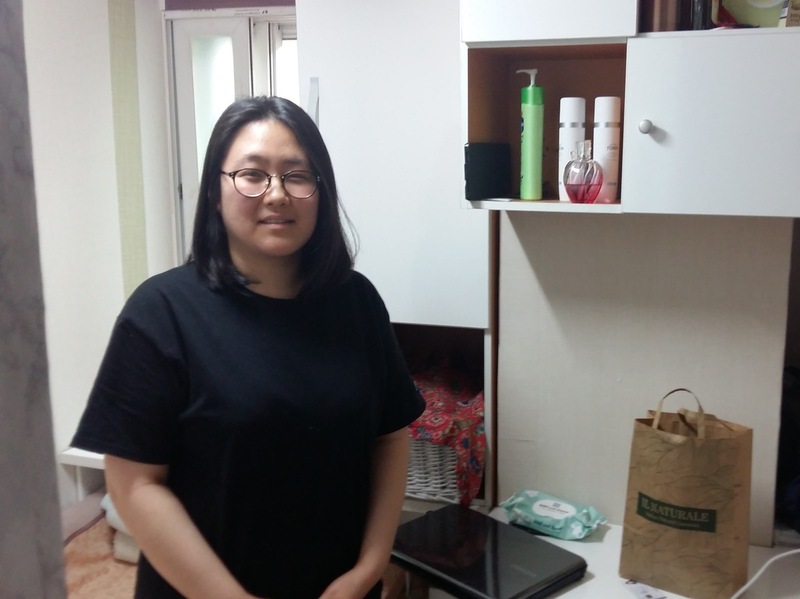 Like Lim in her tiny apartment, many Koreans study for years. Hyundai requires a six-hour exam, just to get your foot in the door. Samsung has its own version of the SAT. President Moon won office May 9 in part on a promise to ease youth unemployment by creating more public sector jobs. But some economists say that's only a short-term fix. "Job creation should be [by] business, not the government," says Kim Gwang-Suk, an economist and professor at Seoul's Hanyang University. "In the long term, all the government should do is make an environment in which companies can invest more." Kim says the new president should help small businesses, boost entrepreneurship, and reform the conglomerates. On the campaign trail, Moon promised to do just that. But the conglomerates remain the backbone of the Korean economy. It's unclear whether he really has the will or ability to change them. In the test prep section of a big Seoul bookstore, young people sit on the floor, pouring over test materials on a Saturday morning. "As the economy goes bad, there aren't many good jobs, and the competition is fierce," says Baek Eui-hyun. He's 28 and still unemployed, after studying for two years for a public administration exam. He failed twice, and is browsing for other tests he might take. He says young Koreans are frustrated. "Of course they don't want to spend their time being stuck in a tiny room studying books for exams," he says. "But there aren't any alternatives." The President Moon's success may be measured not only in how he deals with North Korea, but in the alternatives he offers some of his youngest voters.